Bellwether 60 inch X 30 inch Alcove Bath With Integral Apron And Left-Hand Drain, White An update of a bestseller, Bellwether features a clean, contemporary design in a popular, industry-standard size. Its integral apron simplifies alcove installation, while a low step-over threshold allows for comfortable entry and exit. Bellwethers wide ledges provide storage space for towels, toiletries, and other items. Crafted from enameled cast iron, this bath offers years of reliable performance. 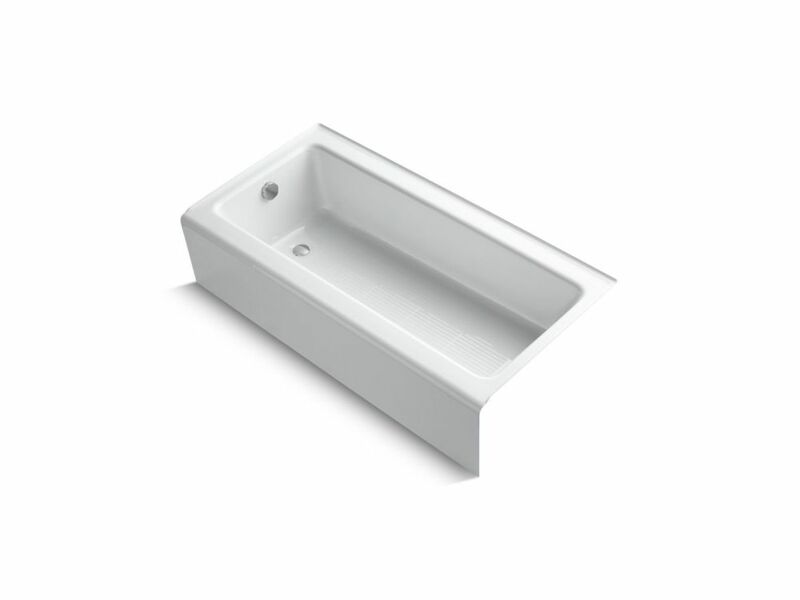 Bellwether 60 inch X 30 inch Alcove Bath With Integral Apron And Left-Hand Drain, White is rated 4.0 out of 5 by 49. Rated 5 out of 5 by EC from Beautiful tub! We had a deep tub but found it... Beautiful tub! We had a deep tub but found it difficult to get in and out, and we almost never needed so much water for soaking. This is just the right tub for us. It may be hard to see from the picture but this tub is square with shaper lines which gives it a very modern look. Well built too. Rated 5 out of 5 by Rosie from I purchased this tub from a local plumbing store. As others have stated, the tub is very heavy. M... I purchased this tub from a local plumbing store. As others have stated, the tub is very heavy. My husband and I were able to move the tub from the garage to the bathroom using a flat dolly (purchased from Harbor Freight). It was so heavy, the wheels on the dolly left marks on our wood floor. As a word of advice, protect your floors if you're rolling it in! As others have described, the sides have a ripply effect, but I don't mind it. In fact, I kind of like it because it reflects light onto my tile floor and looks like glistening water. Another piece of advice: protect all sides of your tub with towels or something thick (not just paper) while plumbing and tiling are in progress. We covered the tub in thick paper, yet still, our tub was scratched in a few areas. The tub is pretty shallow. If you are a tall person, it's awkward trying to get both your legs under water if you're taking a bath. The tub keeps your bath water very warm for a long time! Some people worry that cast iron is too cold. Don't listen to those naysayers. As soon as the warm water hits the cast iron, it warms up immediately. No need for radiant heat or insulation underneath the tub. All in all, I love my solid, sturdy, cast iron tub! You knock on the side, and it sounds like a tank. Try knocking on the side of a plastic tub--completely hollow and flimsy. Rated 3 out of 5 by Manny from I returned these bathtub is to heavy to install. A well built tub but very heavy. I returned these bathtub is to heavy to install. A well built tub but very heavy. Rated 4 out of 5 by bathremodel from When I ordered it I did not realize it had nonslip strips on the bottom, which give it a strange ... When I ordered it I did not realize it had nonslip strips on the bottom, which give it a strange feel and I do not know how to clean them. Otherwise, it is a good sturdy cast iron tub. Rated 5 out of 5 by Philadelphiacondoremodel from Our contractor who put it in said it's the nicest... Our contractor who put it in said it's the nicest bathtub he has seen in his 30 years of remodels. I love the clean lines on this bathtub - perfect rectangle shape that allows for additional comfort. What is the difference between K-875 and K-837 Kohler Bellwether models? &nbsp;As far as I can tell everything looks the same but they are priced differently. Hi, this is Laura with Kohler Co. I am happy to assist you with your question. The K-837 measures 60&quot; x 30&quot; and K-875 measures 60&quot; x 32&quot;. Thank you for choosing KOHLER.